News Detail - S.O.R.G. Course on Customised Facial Implants and 3-D Surgical Planning, Kuwait City, Kuwait - S.O.R.G. 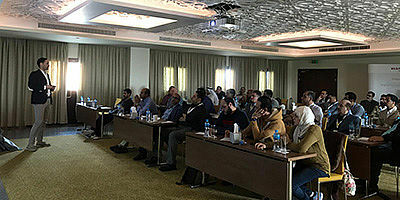 A high calibre cohort of surgeons and orthodontists were in participation from several countries around the Middle East and they were supported by a highly specialised faculty consisting of John Devine (Abu Dhabi, UAE) and Christian Freudlsperger (Heidelberg, Germany). The 2-day course, from Nov 30th - Dec 1st, 2018, consisted of interactive lectures covering customized cranial, orbital, midface, mandible and orthognathic treatment options along with a hands-on component utilising an intuitive 3D virtual planning software. Some great discussions and topics were raised throughout and the team look forward to holding the next S.O.R.G course in the Middle East region.